We Be Reading: 1000TH POST-STRAVAGANZA!!!! We couldn't decide what to do for our 1000th post on We Be Reading so here is, well, some of EVERYTHING! These are the already-read books that currently reside on the floor downstairs. Boxes of paperbacks and teetering towers of everything from graphic novels to lots and lots of Heyers. I'm not even sure how many new shelves I would need for all of these. But wait, there's more! 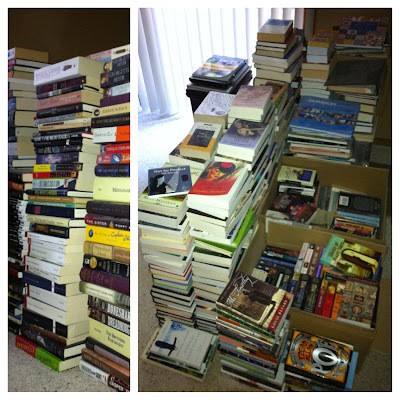 These are the unread books that live in our bedroom. The bottom left nightstand is the husband's and also holds some of his fave graphic novels. The top left is my nightstand, complete with non-fiction area and, again, some very tall stacks. The bookshelf on the right is actually to the left of my nightstand -- the top shelf is my RIP stash! And finally, these are the shelves in Z's bedroom. The top shelf is his Pokémon collection, books and figurines and his box of cards. The other two shelves are a rotating collection. Through the summer, he would choose a new book each morning to bring downstairs with him (his own idea!). I try and put fresh books from the downstairs shelves up there every month or so. And lastly, what is a milestone post without a giveaway? 1000 posts means 1000 pennies for you -- or, in a more useful form, a $10.00 USD gift certificate to Powell's (or the bookstore of your choice) or Out Of Print! This giveaway is open worldwide and I'll choose a winner at the end of day on Sunday, October 7th. The winner can choose where they want to spend my cents. How to enter? Just leave a comment on this post and make sure there's a way to contact you. Thank you all for sticking with us (or joining us along the way) on this long journey! Here's to a few more posts after this one. Congratulations. May there be many, many more. Thank you! The thought of 1000 more seems crazy but maybe I'll make it! Congratulations! That is awesome and this is also an awesome amount of books! 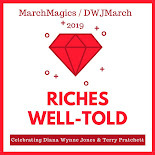 That's the magic of book blogging -- even though I missed wonderful books like the Green Knowe series, I had the chance to find out about them now and fall for them the way I should have when I was young! 1000 posts is a massive achievement! May there be gazillions more! I have sympathy for the teetering piles - been there myself. I found double-stacking bookshelves to be the answer. It is A LOT of posts. I never thought I would get there. :) And my shelves aren't sturdy enough for double-stacking but I've got a couple of other ideas brewing. We'll see! 1000 posts is something special!! I've not hit that milestone yet myself but I'm getting there very slowly. I am IN LOVE with your main bookcases … and jealous that you are allowed to have all these books in your house. 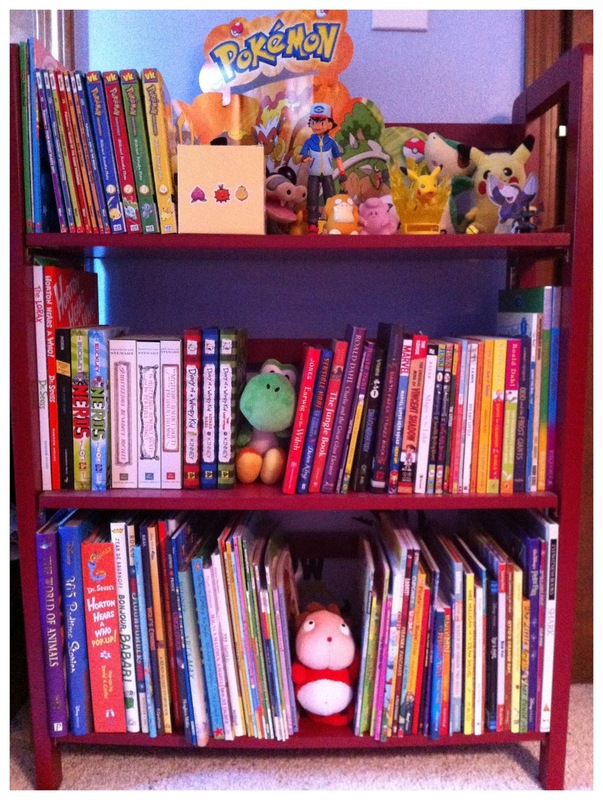 I have ONE measly bookshelf (but a few tiny thin ones I managed to eke out). So so gorgeous!! Here's to 1000 more posts!! Wow, and I thought I had a lot of books! ;) Congratulations on your 1000th post, and here's to 1000 more. Mine are the books for three of us ... or at least that's my excuse for having so many! I really miss having a library. 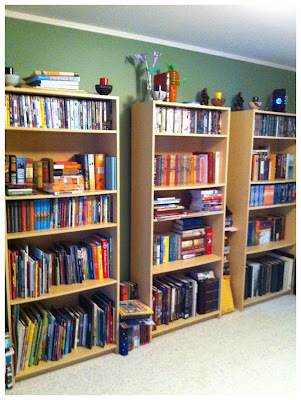 We haven't had a ton of bookshelves since moving to Texas. The sad thing is that 200+ of my books are unread. But I really have been buying less lately so hopefully I'm on my way to catching up a bit with that! And we have a library instead of a dining room since we're not really the entertaining type. It's a room that I still want to improve in so many ways but I love that it exists as is even now. Enjoyed walking down memory lane with you. Thanks! I'm glad that you've been around for most of the trip. It's been fun! Congratulations! You must be so proud :) I love all of the bookishness but I have to say, your son's bookshelf looks particularly inviting. I'm certainly shocked! ;) And I love his bookshelf. 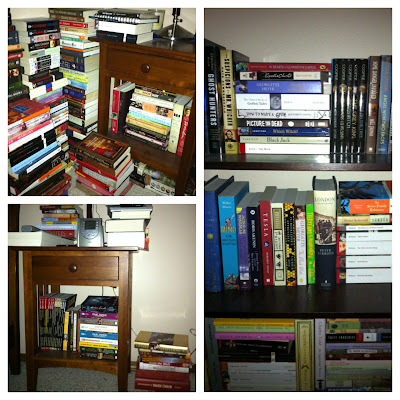 I can't wait until mine changes from being a TBR to being a place for favorite books. Just a few books then? Congratulations on 1000 posts!!! I loved seeing all your stacks! It makes me realize that I am definitely not alone in my stacks!! LOL!!!! This sounds way too familiar! !